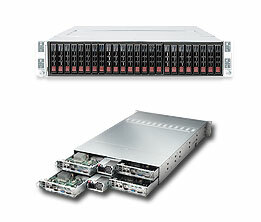 Supermicro extends its lead in Twin server technology with the 2U Twin3 (2U Twin Cubed) 2015TA-HTRF system that includes eight hot-pluggable Intel® Atom™ Dual-Core processor nodes in a 2U form factor (two nodes per single hot-swap unit). Each node also supports 4 GB of non-ECC DDR3-800 MHz SO-DIMM, dual Gigabit Ethernet LAN, 2 USB ports, IPMI 2.0 with virtual media over LAN and KVM-over-LAN support, and 3x 2.5" SATA hot-swap HDDs. The system also includes (1+1) redundant 720W Gold Level power supplies with PMBus, and four heavy-duty fans with optimized fan speed controls. 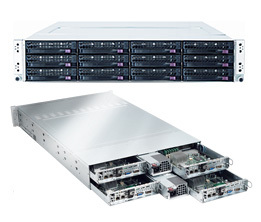 The 2U Twin3 eight-node system is optimized for high-density and low-power environments such as cost-effective data centers, industrial process control, small offices, web proxy servers or cache servers.